A group of 10 cyclists hopes to remind people in the U.S. and Canada that the Russia-Ukraine conflict is still ongoing, four years later. 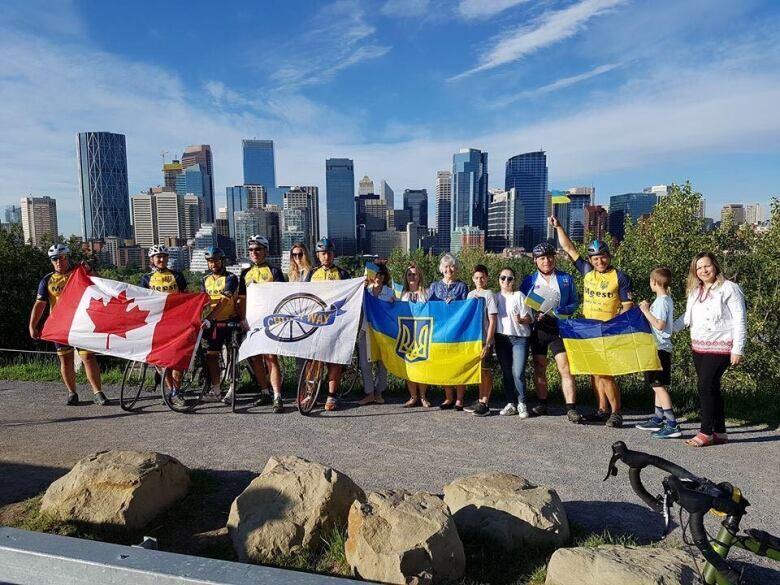 Armed with only their bikes, a team of cyclists from Ukraine are riding 10,000 kilometres across North America to raise money and awareness for the ongoing conflict in their home country. The Chumak Way Cycle Tour made a pit stop in Edmonton Wednesday, a little more than a month into their bike journey. 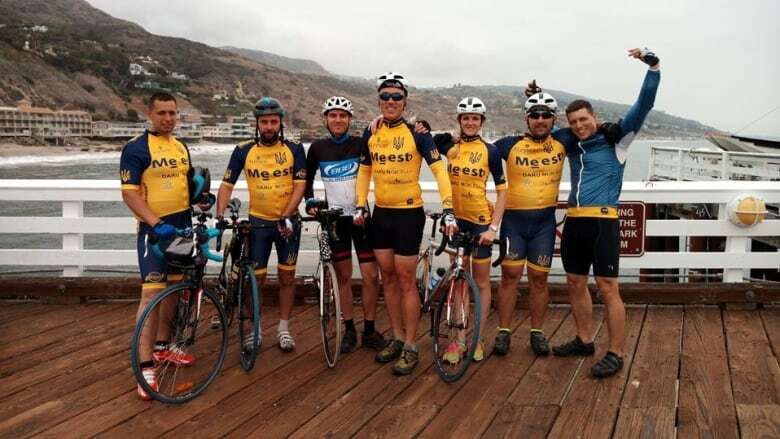 The eight cyclists started pedalling on May 23 in Los Angeles. They rode through California, Washington and then into British Columbia before traversing the Rocky Mountains and ending up in Edmonton. They hope to roll into Washington, D.C. at the end of August. 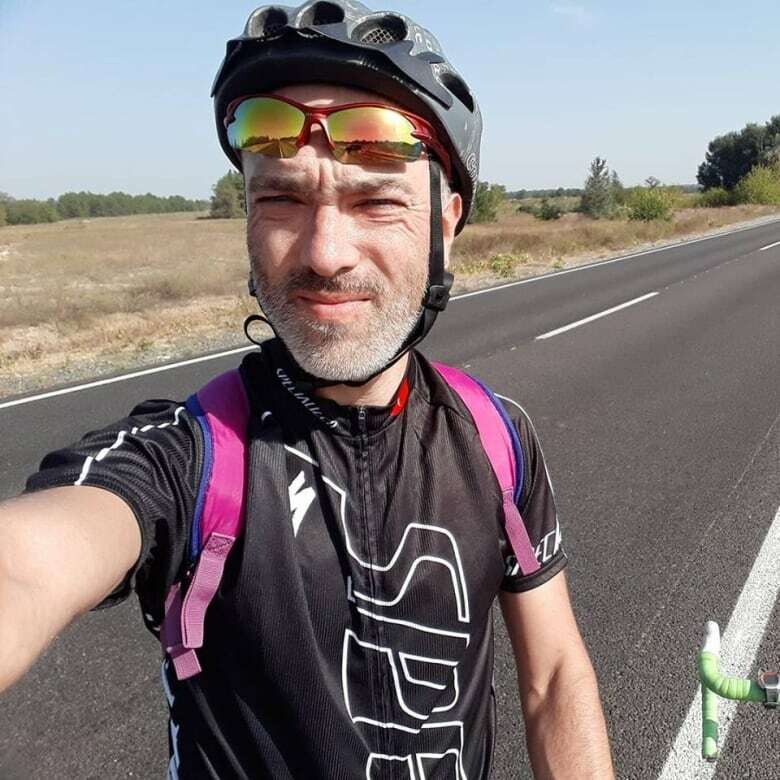 Dmytro Prokin is one of the bikers on the journey. He's not a war veteran, but he lives in Ukraine and is a bike technician who's riding with the group. The goal of the group is to show the world the conflict is still happening, even though it may have fizzled out of the news, he said. "We're riding for peace all around the world," Prokin told CBC's Radio Active. "We are a peaceful nation. We don't need this war. We don't like this war." The war started in 2014 after Russia annexed Crimea. The conflict has escalated at various points, like when Malaysia Airlines Flight 17 was shot down by what international investigators determined was a Russian military unit. It resurfaced more recently when Russian journalist Arkady Babchenko faked his death and resurfaced in Ukraine. Several cyclists are veterans of the conflict. The group is also raising money on their trip, planning to use it to help children whose parents were killed in the war. What started out as a fun way to see some new places — biking approximately 150 kilometres a day — became a job for Prokin, who said the trip has had its difficult moments. "We had +47 C in California and +1 in the Rocky Mountains," Prokin said. "We sleep five or six hours a day, it's a really hard job. Prokin figures riding through the Rocky Mountains was the toughest test. "Everyone told us, 'Watch out for bears,'" Prokin said. They didn't see any, but the hilly terrain and the cold temperatures made it their toughest test yet. But the reception they've received from people more than makes up for the treacherous terrain they've traversed. "People are always asking us about everything," Prokin said, adding the people they've talked to have been more than willing to listen to why they're riding. He hopes people get the message that the conflict is not over and it is affecting families every day. "We can change the history. We can change this war. We can change the world," Prokin said. "People must know the truth."